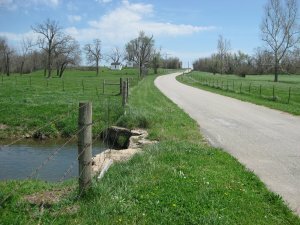 Location: The Skirmish at Dug Springs took place along the Wire Road near current day Clever, Missouri 65631. If you are traveling from Wilson's Creek National Battlefield, it will take between 15 and 20 minutes to drive there. 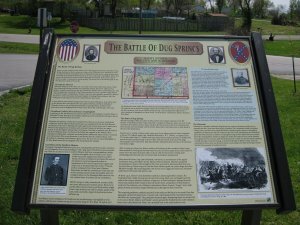 There is a Battle of Dug Springs Historical Marker [ Waypoint = N37 01.689 W93 28.556 ] located in the Clever Middle School parking lot at the corner of Walnut Avenue and W Inman Street (somewhere near here the street name for Inman changes to Old Wire Road). Link to Google Maps. Water flowing from Dug Springs crosses over the Old Wire Road [ Waypoint = N37 01.089 W93 29.733 ] about 1.3 miles southwest down the Old Wire Road from the historical marker. Description: For the night of Aug 1, Union Brigadier General Nathaniel Lyon's forces camped in and around Wilson Creek. Because of reports that Missouri State Guard Brigadier General James S. Rains had 3,000 men southwest near Dug Springs, Lyon decided to form a battalion out of his regular army units. On August 2nd, Lyon placed them under the command of Captain Frederick Steele and sent them southwest down the Wire Road to determine the enemy strength. Lyon sent a section from Totten's Battery to accompany Steele's force. Steele established his defense line just south of Dug Springs. He deployed the guns from Totten's Battery on the high ground just to either side of the Wire Road.The Missouri summer continued hot with temperatures soaring over 100 °F. Lyon's forces struggled to march the short distance from their camps at Wilson Creek to Dug Springs. In the meantime, Confederate Brigadier General Ben McCulloch had a hard time believing reports that the entire Union Army was to his immediate front. He decided to send his trusted lieutenant, Colonel James McIntosh, to scout out the enemy forces. McIntosh went forward with Rains and was able to see the Federal encampments off in the distance. McIntosh reminded Rains about McCulloch's orders not to engage the enemy forces and then left to report his findings to McCulloch. Rains continued to probe the Federal positions. Sometime between 4:00 and 6:00 P.M. on August 2nd, some of Rains cavalry units began skirmishing with Steele's infantry units. Totten's battery began firing cannister into the enemy lines. Captain David S. Stanley commanding a company of troopers from the 1st US Cavalry ordered a charge into the enemy. Rains' forces panicked and fled back down the Wire Road back to the Southern camps. The Confederate troops would refer to this episode as "Rains' Scare" and it served to add to McCulloch's feelings that he cold not count on the Missouri State Guard troops. 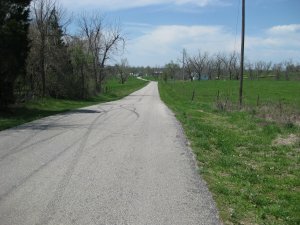 The skirmish added to the rift that existed between McCulloch and Major General Sterling Price of the Missouri State Guard. That night, Lyon rested his forces and renewed his forward movement in the morning on August 3rd. Lyon marched another three miles down the Wire Road and set up lines of battle near a small community called Curran's Post Office. There was another brief skirmish just before noon with troops from Colonel T. J. Churchill's 1st Arkansas Mounted Rifles. The Arkansans withdrew back to the Southern lines of defense, hoping to lure the Federals forward into battle. Lyon did not take the bait. At a council of war that night, Lyon decided to withdraw back to Springfield, Missouri the next day. His forces were low on supplies and exhausted from the continuing summer heat wave. They arrived back in Springfield in the evening on August 5, 1861. In Springfield, Lyon found that conditions there had not changed. There were no reinforcements from Fremont and Lyon's men were still low on supplies. Even knowing that his forces were in poor shape, Lyon still could not decide what to do next. He did not feel he was strong enough to go up against the Confederates but was loathe to withdraw to Rolla, Missouri. McCulloch, too, was considering withdrawal because of the poor condition of his troops. He also did not trust the effectiveness of the Missouri State Guard as a fighting force. Sterling Price made an impassioned argument against withdrawal from Missouri. On August 4th, McCulloch decided to attack the Federals. But on August 5th, he discovered that the enemy was retreating to Springfield. Pursuit of the enemy did nothing more than tire out McCulloch's troops. The Federals were back in Springfield and the Southern forces encamped along Wilson Creek.